1. Layout about six pieces of newspaper, one on top of the other, and roll them up starting on a long side. 2. Place another full sheet of newspaper on the floor and set the newspaper roll at one corner so that the corner of the newspaper is at the center of the roll as shown in the picture. Roll the newspaper around the newspaper roll and tape it closed in the center (on the opposite corner). Stuff the extra newspaper into one end of the roll. Cut the extra newspaper off the other end of the roll. 3. Cut six inch slits about 3/4" apart around the cut end of the roll to make the rake. 1. Math Review Games - Write math facts on leaves (Write the same math fact on both sides of the leaf) and have your children race to separate the math facts into groups using their rakes. For example, you may tell the children to find all the math facts that have an even answer. They would then use their rakes to move the leaves with even number answers to a designated area. The child that finds and piles up the most leaves matching your description wins. 2. Word Review Games - Write words that your children are studying on leaves and place them on the floor. 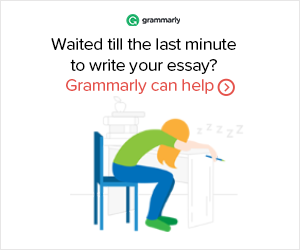 You can use them to review many things such as nouns, verbs, adjectives, sight words. 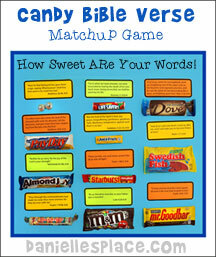 Have your children separate the words into piles according to what you say. For example, you can tell them to find all the leaves with words that are verbs. 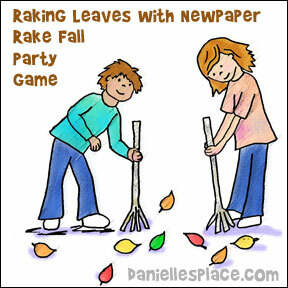 The child that piles up the most verbs using only his leaf rake wins. 3. Fall Festival Games - Break children up into teams. Give each team a designated area in which they can rake their leaves. (You can use masking tape to tape off areas.) Have all the children stand in a circle, and then place all the leaves in a pile in the middle of the circle. On the word "go" children should try to rake as many leaves as they can to their designated areas. The team that gets the most leaves wins. You can place stickers or write words on some leaves. Tell your children that if they find one of these leaves and rake it into their piles they will win a special prize. 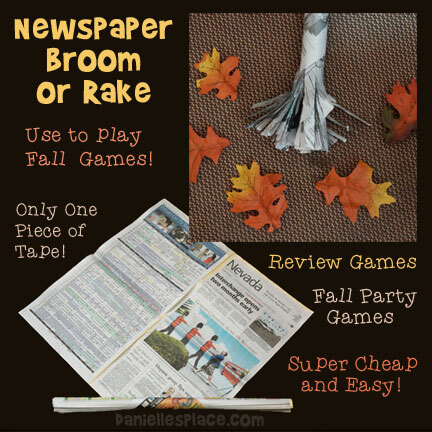 We would love to hear how you used the newspaper rakes and leaves in your classroom. Email us and we will place your ideas here. 1. 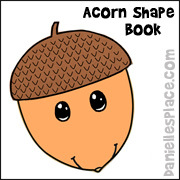 Print out the leaves and acorn patterns and the saying pattern onto colorful paper. Cut out the leave patterns and use them as templates. 2. Cut craft foam pieces big enough to fit the leaf patterns. Cover the craft foam with foil tape. 3. 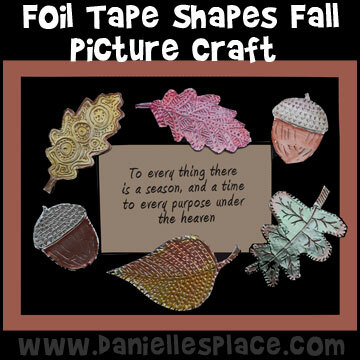 Place the leaf or acorn templates on top of the foil tape and craft foam and trace around the edge. 4. Cut out the shapes and then engrave the tape with objects such a straw, tip of a paint brush, ball point pen, etc. by pressing the objects into the tape or drawing designs on the tape surface. 5. Use permanent markers such as Sharpies to color in the patterns. Do not press down on the tape when coloring. Quickly wipe off the excess ink with a paper towel to make the ink translucent. 6. 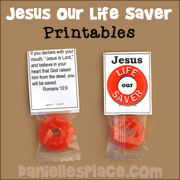 Cut out a saying pattern and glue it to the center of a piece of construction paper or card stock. Glue the leaf and acorn shapes around the edge of the saying. 1. 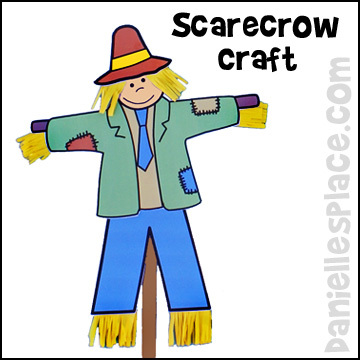 Draw a picture of a scarecrow without a hat and straw on a piece of card stock. 2. Cut the scarecrow out and glue it to a paint stick. 3. Cut small pieces of yellow paper about the length of the bottom of its pants and arm sleeves and then cut slits in the paper to make it look like straw. Glue the pieces to the arms and legs as shown in the picture. 4. Cut two more pieces of yellow construction paper to make the hair and cut slits to make it look like straw. Glue the pieces to the head and then glue the hat on top. 1. Cut brown construction paper into one-inch thick strips and staple them to your bulletin board to make a rustic looking fence. I cut the paper so that they were uneven to make the fence look old. You could also use white paper and make a picket fence. 2. 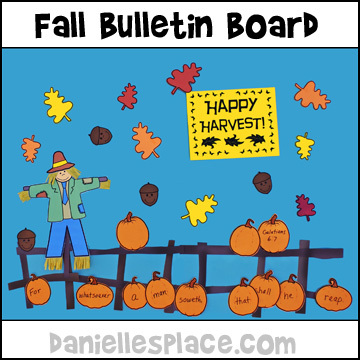 Make a "Happy Harvest" sign and print it out onto yellow paper and staple it to the top of the board. 3. 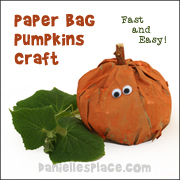 Cut pumpkin shapes from orange and brown paper and staple them to the board. 5. To make the scarecrow use the pattern above. 1. 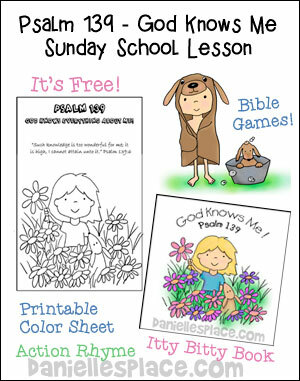 Print out the pattern and have your children color it. 1. Print out the patterns sheets and cut out the shapes. 2. In class have your children write a fall poem on the frame and glue onto the middle of a sheet of construction paper, and then glue the fall pictures around the sides of the paper. Children try to match the seeds to the appropriate plant. Leaf man used to live in a leaf pile, but is blown away by the wind. Where did he go? 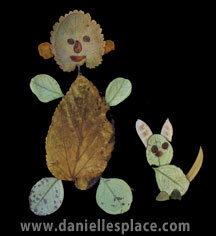 Ehlert uses leaves to make all kinds of animals that leaf man might see on his journey. At the end of the book she encourages children to look for leaf man in their own yards. 1. 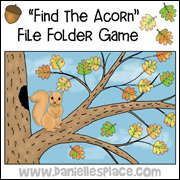 Have your children collect fall leaves, acorns, and other natural items to make their own leaf men and other creatures. 2. Place the leaves in a book between layers of waxed paper and set heavy books on top. Let them dry for several weeks before gluing them to a piece of construction paper to make a leaf man or other creature. 1. Before class make the baskets from tan or brown card stock. To make the baskets fold a piece of paper 8 1/2" x 8 1/2" in half, corner to corner to make a triangle. 2. Place the folded piece of paper on a table so that the folded, long edge is at the bottom. 3. Fold over the right, bottom corner so that the point meets the left edge of the triangle. 4. Fold over the left, bottom corner so that the point meets the right edge of the triangle. 5. Fold down the top layer of the top corner along the top edges of the folded corners. Turn the bucket over and turn the top corner over the same way. 6. To make the edge of the basket as shown in the picture, unfold the top corners you just folded down, and fold them in half and then in half again, and then fold them down on the first fold you made. 7. Print out the leaf patterns and use them to cut leaf shapes from fall-colored paper. Have your children write their vocabulary words on the leaves. Gathering Leaves - Place all the leaves face-up on a table in front of your child so that he can see the words. 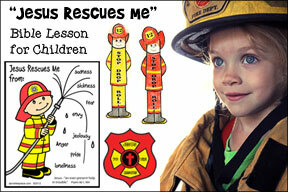 Tell your child that he can place all the leaves that he can read in the basket. If your child picks up a leaf that he cannot read, tell him what the word is and have him repeat the word. Place that leaf in a pile to be used after he has tried to read all the leaves on the table. When he has gone through all the leaves, place the ones he has missed on the table, and have him try to read the words again. Keep playing until all the words are in the basket. Matching Game - To play this game make sets of matching words, and more paper baskets. Give each player a basket. Turn all the leaves over on a table so that the words aren't showing. Take turns turning over two leaves to see if the words match. The player that turns over the leaves should read the words on each leaf. If the words match, the player gets to keep the leaves and place them in his basket. The player with the most words in his basket wins. 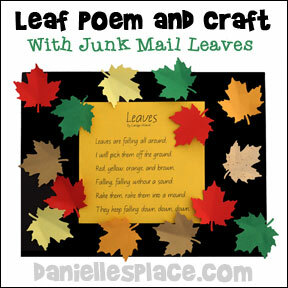 All the leaves for this craft were made using a leaf punch, and envelopes and other paper from junk mail. 1. Print out the poem pattern and make copies. Or you can have your children write their own poems about fall leaves. 2. Glue the poem onto the center of a piece of construction paper. 3. Glue leaves around the poem to decorate the frame. The leaves pictured above were all made from junk mail envelopes and paper using a large maple leaf punch. The paper often got stuck in the punch, and I had rip the paper to get the punch away from the paper, and pull out the paper that got stuck in the punch, but it wasn't that difficult. I creased the leaves down the center and on both sides to give them a little depth. Instead of using paper leaves you can buy Fun Foam Leaves from Amazon. 1. Collect fall leaves when they are dry. 2. Place the leaves in between layers of old newspapers and then place books or other heavy objects on top of the newspapers. 3. Wait about a week before removing the leaves. 1. To make the main stake, roll up 6 sheets of newspaper to make a tight roll. Roll another sheet of newspaper around the roll and tape it closed. For the arms, roll up 5 sheets of newspaper to make a tight roll. Roll another sheet of paper around the roll and tape it closed. Glue or tape the arms across the main stake to make a cross shape. 2. To make the head stuff a brown lunch bag with crinkled up newspapers. Place the top of the bag on the top of the main stake and gather it around the stake. Tape it to the stake. Draw a face on the bag. 3. To make the clothes. Open up some brown grocery bags and flatten them. 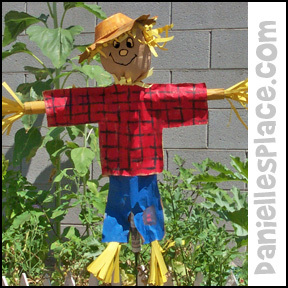 Place the scarecrow frame on the grocery bags. Draw around the frame to make an outline of a shirt and pants. Draw the outline at least 3" from the edge of the frame. Cut out the shirt and pants shapes and use them to trace another pattern for the back of the shirt and pants. Paint a design on the shirt and pants and then glue or staple the front and back shapes to each other onto the frame. Leave the arm holes and leg holes open. 4. To make the straw for the hands, feet, and hair. Fold a piece of yellow construction paper in half lengthwise. Cut slits down the short length of the folded paper, but do not go all way through stop about 2" before you get to the fold. Roll the paper up and crinkle up the cut paper slightly. Place some glue on the folded end and shove them into the arms. 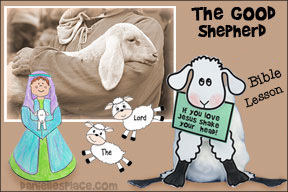 Glue or staple some straw in the arm and leg holes, and around the neck, and on the head. 5. To make the hat, lay another grocery bag out flat on a table. Place a paper bowl in the center of the bag. Trace around the edge of the bowl and then draw a large circle around the bowl. Cut out the circle and the inter circle. Glue the circle onto the hat. Paint the hat and glue it to the head. 6. To display your scarecrow, pound a stake into the ground and slide the scarecrow on the stake.